Can't quite fit the 4 piece band into your venue? Or maybe the budget is being squeezed? Then go for the Abba Duo! 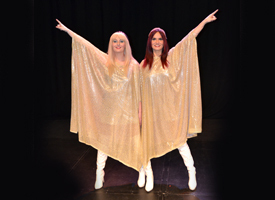 This Scottish Abba Duo is a glamorous reproduction of Abba in their heyday. Enquire now for availability. To save you hiring in a separate DJ, Abba A Rival can provide you with music through their state of the art Bose PA system for a complete evenings entertainment at a competitive price. Make up a play list on your ipod if you prefer also or we can provide music for you. Scottish Abba Tribute Duo -Abba A-Rival are made up of predominately music school graduates who have dedicated their careers to the love of music. As a full time tribute band they have full Public Liability Insurance, high spec PAT tested equipment and are reliable and professional.